We are no longer able to ship products to California. We apologize for the inconvenience. Fly Terminator Pro is an insecticide-free fly trap ideal for use around livestock operations. The reusable, durable plastic gallon jug can trap up to 35,000 flies! The no-rust plastic top doesn't rust even when exposed to the elements. The reusable jug includes a sturdy handle that makes the Fly Terminator Pro easy to hang. ABC PIT! is a simple, yet reliable, biological solution for removing organic solids. 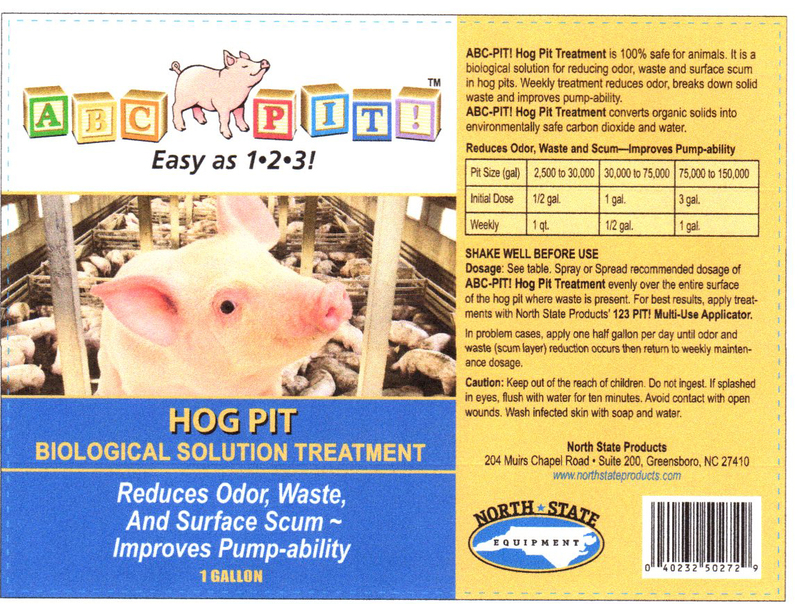 Reduces odor, waste and surface scum in hog pits. Weekly treatments effectively break down solid waste and improve pump-ability. The solution converts organic solids into environmentally safe carbon dioxide and water. 100% safe for animals! Using ABC PIT! is easy as 1-2-3! Simply spray or spread the treatment evenly over the entire hog pit surface where waste is present. For best results, apply treatments with North State Products' new 123-PIT! Multi-Use Applicator (coming soon). Restricted Drug (California) - Use Only As Directed. We cannot ship this product to California. We apologize for the inconvenience. Agri-mectin 1% is an injectable form of ivermectin widely used for the control and treatment of infestations of a broad spectrum of internal and external parasites in cattle and swine. Convenient low dosage of only 1 ml per 110 pounds of body weight for cattle and 1 ml per 75 pounds of body weight for swine. Sows must be treated at least seven days before farrowing to prevent infection in piglets. Clovite Conditioner is a vitamin supplement for all species of animals featuring Vitamin A, Vitamin D and Vitamin B12. Ideal vitamin supplement for horses, cattle, swine, poultry, dogs, cats and even mink. Soybean meal, Soy flour, Vitamin A & D oil, Dicalcium phosphate, Vitamin B12 supplement, Vitamin A & D3 supplement, Choline chloride, Vitamin E supplement, Calcium pantothenate, Niacin, Pyridoxine hydrochloride, Thiamine hydrochloride, Riboflavin, Biotin. Young Foals and Weanlings: 1 to 2 tablespoonfuls daily. Brood Mares: (latter half of pregnancy and lactation) 2 tablespoonfuls twice a day. Colts, Stallions and Horses in Training: 1 tablespoonful per 400 lb daily. All Farm Animals: 1 to 3 lb to each 100 lb feed. Mature Cattle: (milking or on full feed) 1 to 3 lb to each 100 lb feed. Many dairymen prefer adding a handful to each feeding. Feedlot operators simply top off feed with the prescribed amount of Clovite. Calves: (bucket fed) 1 to 2 tablespoonfuls daily in milk or ground feed. Range Cattle: Supplemental feeding is simplified by mixing with salt - 1 part to 10 parts salt, or 2 1/2 lb to 25 lb salt. (These calculations are based on normal consumption of 1/4 lb of salt per day by a 1,000 lb cow and 1/8 lb per day by a 400 lb steer.) To prevent the oxidation that tends to destroy all Vitamin A compounds on prolonged exposure, mix only the amount normally consumed in a 3-week period. Poultry: 1 lb to each 100 lb feed. Baby Pigs: 3% of the creep-feed. Dogs and Cats: 1 level teaspoon per each 10 lb of body weight daily. This dosage should be doubled for growing pups and kittens, lactating animals and animals in the last half of pregnancy. Dosage may be varied as prescribed by the veterinarian. Mink: 1 level teaspoon daily.